It is almost impossible for me to believe that my daughter completed preschool 2 weeks ago and that in the fall she will be going to kindergarten. The theme for her preschool graduation jubilee was Disney Stars. When I found out that the preschool needed Mickey and Minnie ears for their jubilee I was happy to help out. I found a wonderful tutorial from the Suburban Mom. I ended up doing some things a tad different, but her tutorial was a great starting point for me. Headbands - I used plastic ones that were covered in fabric. They were 1/4" wide and I got them at the Dollar Tree in a 6pk for $1.00. Plus they were children sized perfect for preschoolers. Black Felt - I bought the felt that comes on a bolt because the sheets of felt were not long enough to cover the headbands. Foam Sheets - I used 6"x9" sheets that were adhesive backed. I bought a bulk pack of 60 sheets. They were rainbow colored but it doesn't matter because you are covering them with felt. Circle - You will need something to trace a circle with. 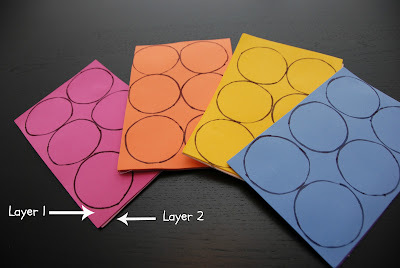 I used my scrap booking supplies to make a 2.75" circle on cardstock to use as a pattern. Scissors - You want them sharp enough to cut felt, but don't use your favorite pair because felt dulls the blades. White Pencil - You can buy a chalk pencil or raid your kids' colored pencils. I used a white Crayola colored pencil and it worked great. Black Marker - I used a Sharpie. Hot Glue Gun -You could use a low temp glue gun but I just used my regular one. Hot Glue - A lot of it! Template for Ears - You can use the one at Suburban Mom or make your own. Since my headbands were thinner than the one she used I adjusted her template by cutting the rectangle part in half and taping it back together so the part that wraps around the headband was thinner. 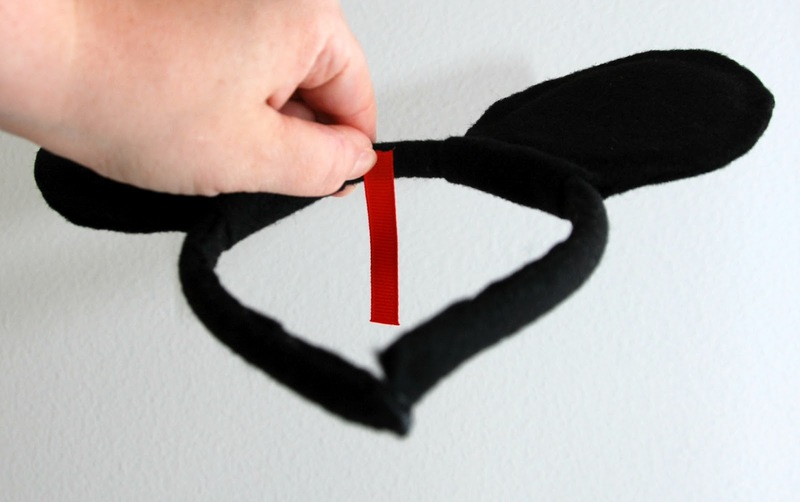 Ribbon - If you are making Minnie ears you will need this. I used 1.5" ribbon to make the bow and 3/8" ribbon to make the center of the bow. Cutting Mat - To cut the felt on. Rotary Cutter - Like this one, to cut the strips of felt to cover the headbands. 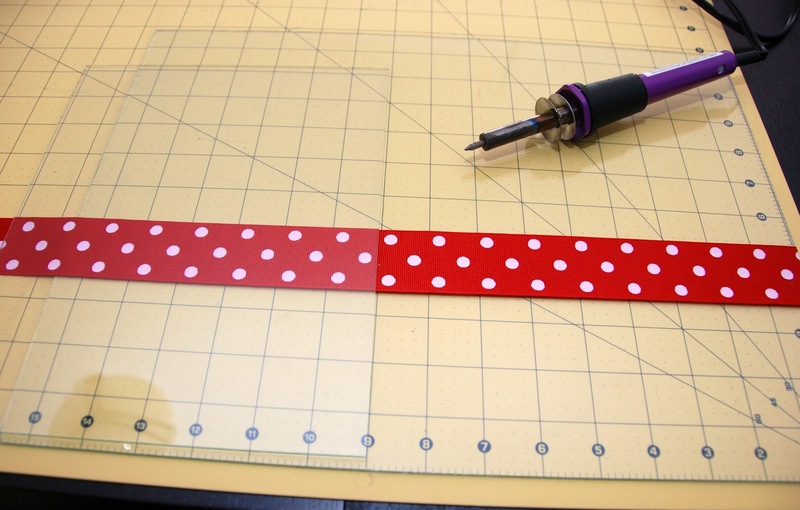 Quilting Ruler or Straight Edged Object - To use with the rotary cutter. Heat Sealer - For the ribbon. 1. Cut the felt into strips. My strips were 16" x 1.5". The rotary cutter made this very quick and easy. 2. Cover the headbands with felt. Put a thin bead of hot glue along the inside of the headband pressing the felt down as you go. Then wrap the felt around the headband. Next start a bead of hot glue on the inside of the headband (on top of the felt you already glued down) and glue the loose edge of the felt down along the length of the headband. I recommend only doing 2" at a time so the glue doesn't cool before you get the felt attached, and you avoid hard bumps. 3. Put a drop of hot glue in the open ends and pinch them closed. 4. Once the hot glue is cooled trim off the excess felt. 5. Attach 2 pieces of foam back to back and trace circle on them. This will double the thickness of the foam for the ears but not double your tracing and cutting. Remember the foam can be any color and the cutting doesn't have to be perfect because your covering them with felt. 6. Cut your circles out. 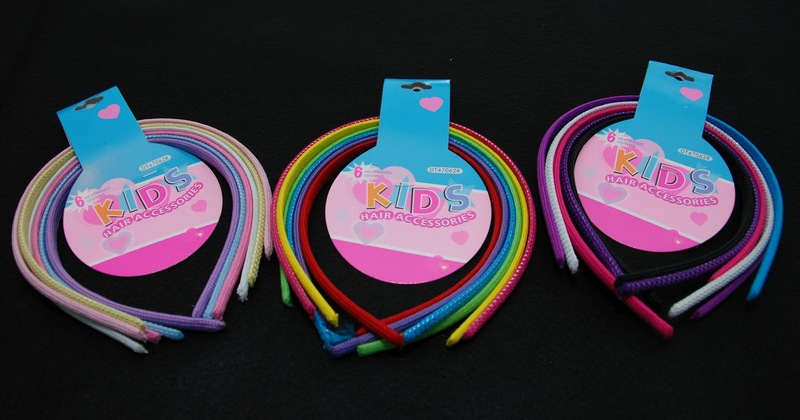 You will need 2 for each headband. 7. 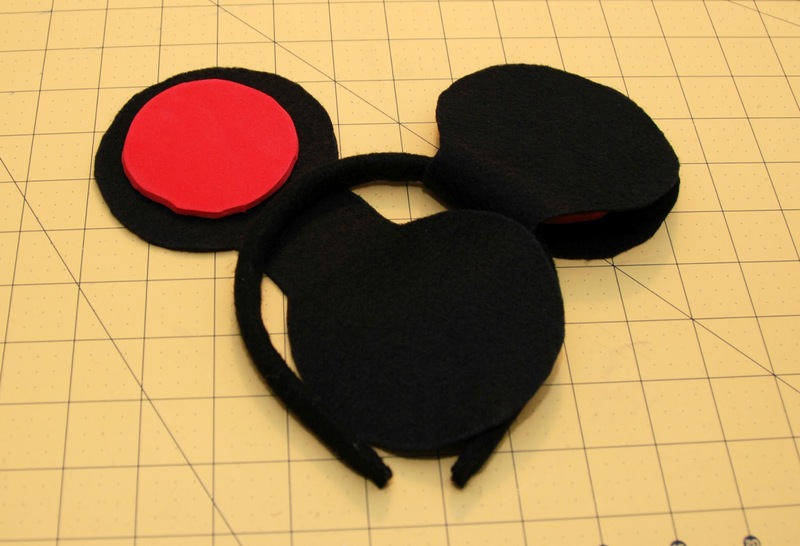 Trace your ears onto the felt using your template. You will need 2 for each headband. Make sure you cut one out and adjust the center rectangle part to fit your headband before continuing. 8. Cut out your ears. 9. Start building your ears by putting a thin drizzle of hot glue on one side of a foam circle and attaching it to the felt ear. 10. Place the ears where you would like them located on the headband. Mine were about 1.5" apart. 11. Glue the part that wraps around the headband to the headband. 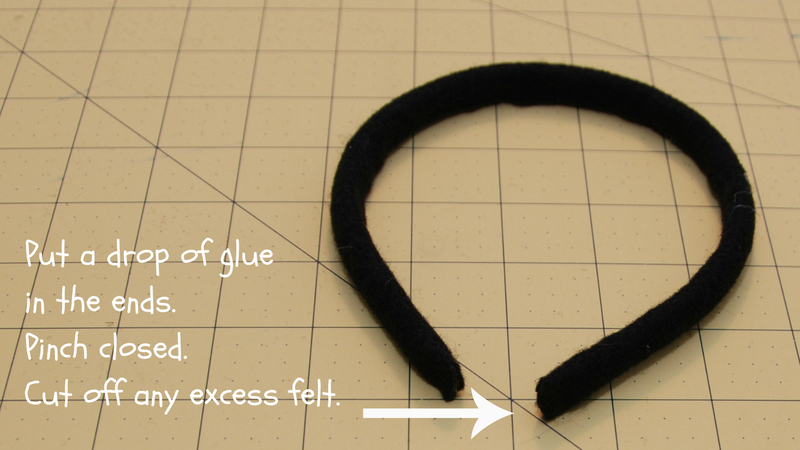 Placing the hot glue on all sides of the headband is key here, but you don't want it to ooze out. 12. 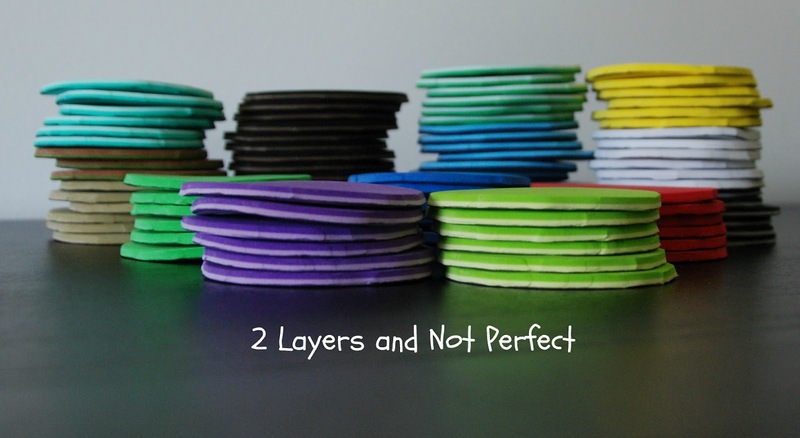 Put a thin drizzle of hot glue on the foam circle and attach the felt to it. 13. Run a thin bead of hot glue around the foam circle and seal the edges closed. 14. Once they are cool you can trim the ears if your circles didn't match up perfectly. You can also color any place you see dried hot glue with a black Sharpie. - I recommend doing one from beginning to end and make any adjustments before making them in bulk. - Use the hot glue sparingly because anything that oozes out dries white on the black felt. 1. 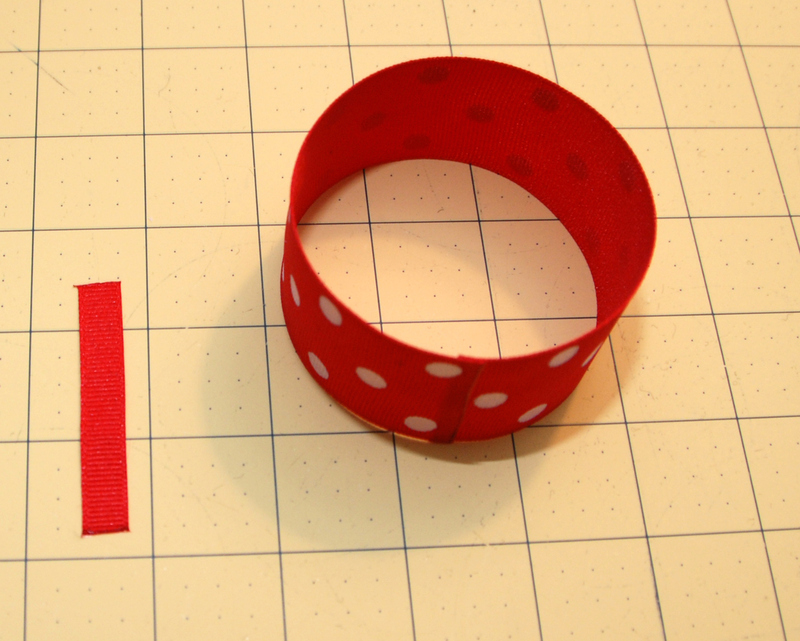 Cut the 1.5" ribbon into 9" sections and the 3/8" ribbon into 2.25" sections. 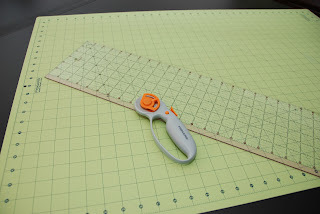 My favorite way to cut ribbon is to lay the glass from a picture frame on top of my cutting mat so I can see the measurements and use a heat sealer to cut the ribbon. If the ribbon is wide I use another piece of glass to have a straight line to cut against. 2. 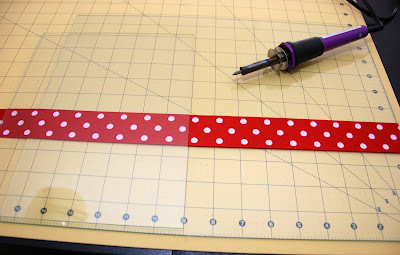 Fold the two ends of the 1.5" ribbon back until they over lap in the center and glue it with a dot of hot glue. 3. Pinch the bow in the middle creating the Minnie bow look. I used a drop of hot glue to keep in in this shape but you could probably skip that. 4. 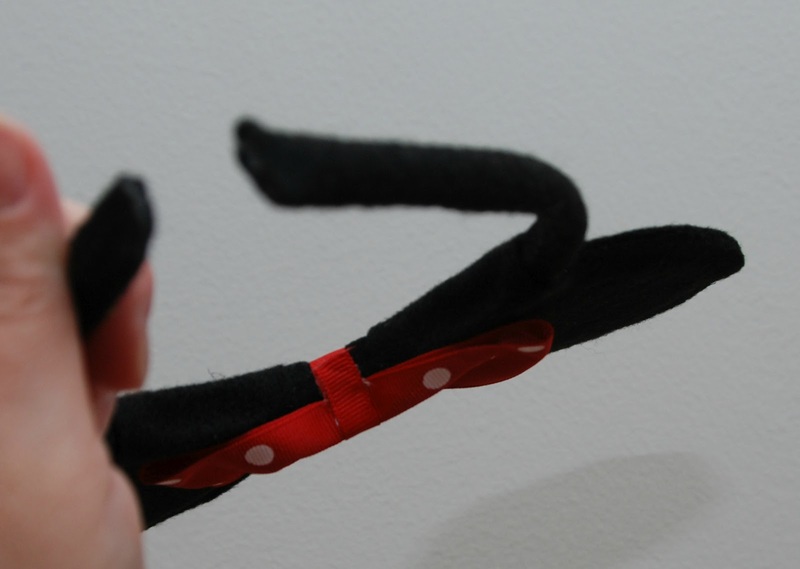 Glue the 3/8" ribbon to the inside of the headband. 5. 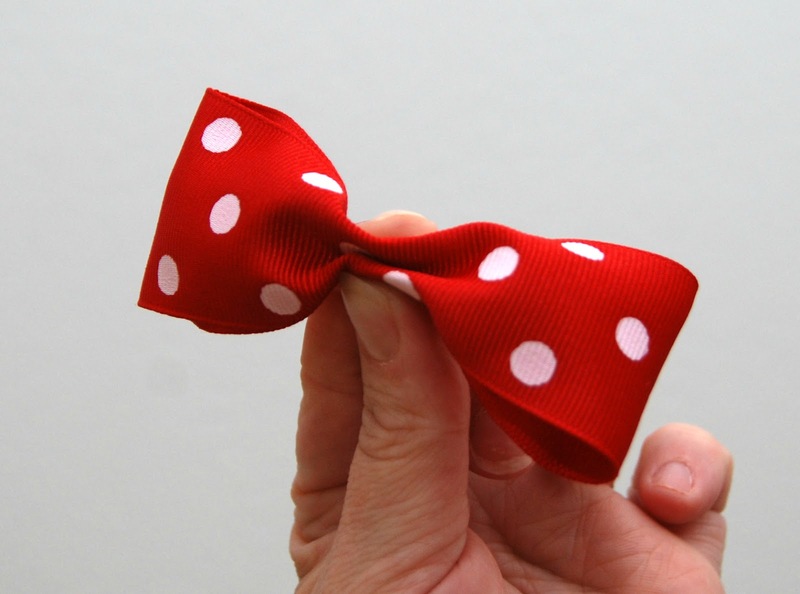 Wrap the 3/8" ribbon around the headband and the bow. Then glue the loose end down. I made 45 of these bad boys and trust me once you get a system down you can make them pretty quick. 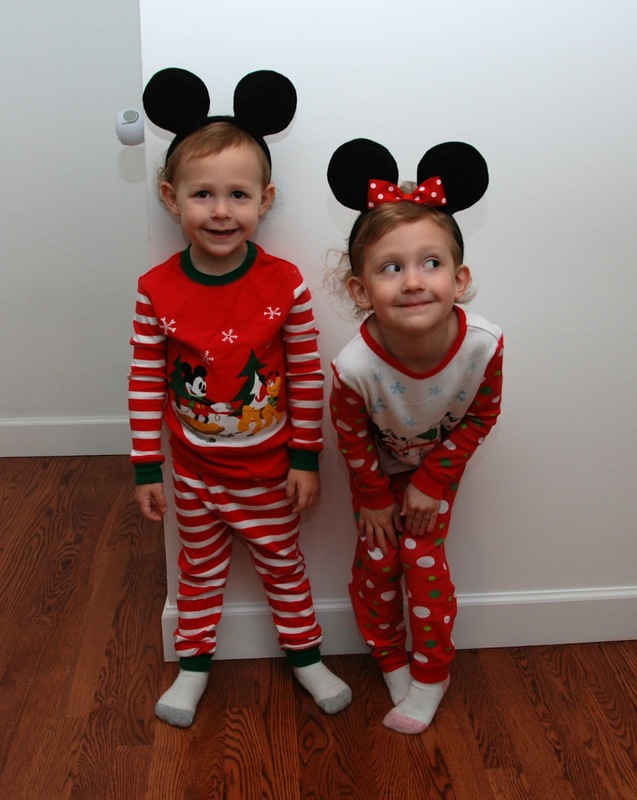 My kids love the ears and the night I finished them they insisted on wearing their Mickey pajamas. That'll save alot of money in compared to buying them at Disney - I've pinned this! Cute ears and cute kids! saw this on top me tuesday.... is it bad that i want to make one for myself more than the kids haha love it! Simply adorable! We are doing the CHOC Walk at Disneyland in October and I'm on the lookout for these kinds of crafts! That is wonderful. If you make them I would love to see pictures. Thanks for stopping by!! Great! and Thanks for stopping by! The ears and your kiddos are so adorable! Thanks so much for sharing with us this week! Thanks! and Thanks so much for taking the time to stop by! Okay, I better start following your blog if I've found two posts in one morning that I like! 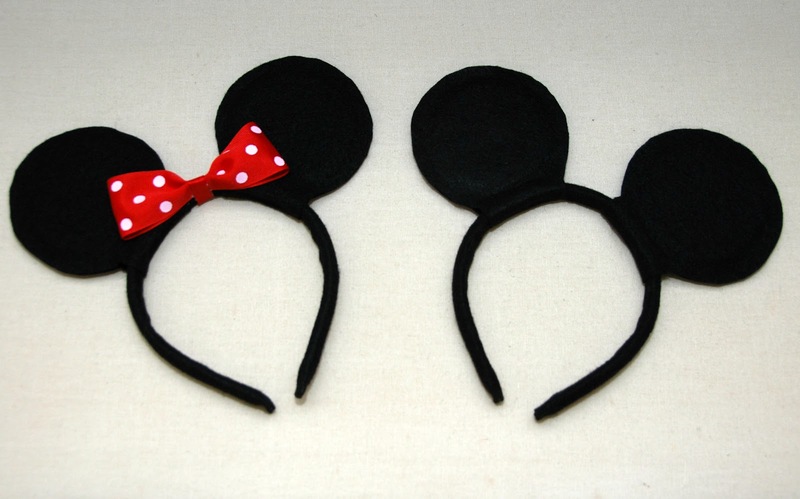 I am making my daughter a Minnie Mouse costume for Halloween, but I hadn't thought about how I'd make the ears yet. This is perfect!!! Thank you! When I finish her costume, I plan to post about it, so I will be linking the ears to your blog. Glad I could help. I will definitely look for your post!!! Very cute and a great tutorial. My little guy is going to be Mickey for Halloween, so I need to make him some ears! Thanks! I would love to see a pic! Thanks for taking the time to show everyone how to make the minnie ears. It was very helpful! 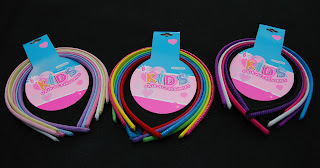 My daughter & friends will love these! Thank you for posting this! I couldn't justify the cost to have them for all the kids at the birthday party, but this will be a much less expensive option! Quick question...How many did you make and how many yards of felt did you use? I don't know how much felt to buy! I would like to get the felt all at once, so I can use a coupon on the whole cut. I made 45 set of ears and I used between 2.5 and 3 yards of the 72" felt. I only used about 20"x72" to cover the bands, and the rest for the actual ears. I hope this helps! is it a 2.75" diameter or radius for the circles cut to make the ears? The 2.75" is the diameter. How did you do the felt ears template? Was the 2.75" for the felt or the foam?